"Fresh ears of corn are coated in a mixture of butter and brown sugar, then wrapped in bacon before either grilling or baking. Decadent, to say the least. But worth the compliments you'll get at this summer's BBQs!" Place each ear of corn on a sheet of aluminum foil large enough to wrap it completely; brush with butter. Season with salt. Spread brown sugar evenly on a large plate. Roll buttered corn in brown sugar. 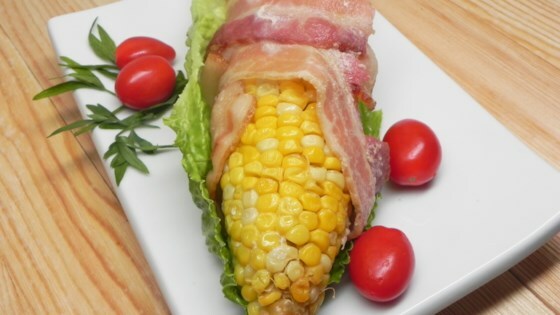 Wrap 2 bacon slices around the length of each ear of corn. Wrap foil around corn, enclosing it completely. Preheat grill for medium heat and lightly oil the grate. Cook foil-wrapped corn over indirect heat, turning occasionally, until corn is tender and bacon is crisp, 35 to 45 minutes. Instead of grilling, you can bake corn in a baking pan lined with parchment paper at 375 degrees F (190 degrees C) for 35 to 40 minutes. Use tongs to turn the cobs every 10 to 15 minutes. For crispier bacon, increase oven temperature to 425 degrees F (220 degrees C) and cook 10 to 15 minutes more.